Jet Boats in Ocean City, Island Watersports Boat Rentals, Yamaha Jet Boats, Pontoon Boat Rentals. 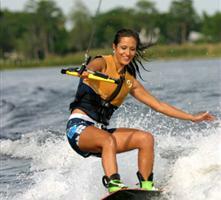 We offer rentals of wakeboards, water skis, tow tubes, and kneeboards. Island Watersports in a locally owned business and employs local help. We started the business to offer our customers the best service along with the best equipment for their rentals. Our commitment to go the extra mile is what brings customer back. Whether you're looking for an afternoon excursion, a vacation or something special like a family reunion, we've got the gear and expertise to help you enjoy your time on the water. Pontoon Rentals: Rent one of our pontoon boats and take it out on the bay for a day with your family or friends. Island Watersports offers the largest selection of pontoon boats on the Delmarva Peninsula. All of our boats are top quality to ensure you are comfortable while on the water. Pontoons offer a relaxing vessel with room for groups of up to 13 people (depending on weight). These boats are great to swim off of, fish & crab, as well as just riding to that nice secluded beach to get away from the summer commotion! Jet Boat Rentals: Get the thrill of a high speed jet boat. We offer Yamaha jet boats of various sizes. These are great for speed or water sports. Island Watersports is the only Maryland/Delaware business to offer Yamaha jet boats. Our jet boats make the perfect watersports boards as well as offering the thrill of speed and great handling. Our jet boats do NOT have a propeller, like many other speed boats. This means that our boats are the SAFEST for those renters with kids. The boats have plenty of power to pull your friends and family on one of our tow tubes, wakeboards, water skis, or knee boards. Boats range in size to meet the needs of every customer and allow for seating for up to 11 people! Jet boats are capable of running over 55 mph. Extras: Tow tubes, wakeboards, water skis, and kneeboards are available to add to any jet boat rental. Fishing poles and nets are available to add to any pontoon or fishing boat rental. Coolers available for any boat rental. *All extras are on a first come, first serve basis. All drivers must be 18yrs of age and be able to present a valid, government issued, photo ID at time of rental. If you are born after July 1st 1972 you must have a valid boater's certificate to drive, or we can issue a temporary one prior to your rental. A security deposit is required for every rental. Deposit amounts vary between $200-$300. In the event the security deposit is made with cash, a valid credit card number must be on hand in the office. We offer personalized water sports services, from rentals and gear to complete instruction. Partner with us to make your day -- or week -- on the bay something special. Book your rentals for this summer today, and up to save 25%. We're offering early booking discounts for May, June, and September. Simply mention code SUMMERTIME when you call one of our water concierges. Ever wanted to learn how to wakeboard, wakesurf, waterski, kneeboard, or go tubing? Maybe you just want to go out on a boat with a professional driver and enjoy some of your favorite watersports?